In looking at my reading choices over the past couple of months, I have realized that I have GOT to add some more middle grade books into my reading diet! I've been reading lots of adult and teen books, which have been great, but I need to give myself a little push to pick up more middle grade and keep things balanced. 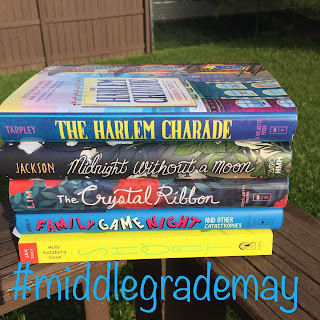 Here are a few of the books on my middle grade TBR stack! So, who will join me for #MiddleGradeMay? Just read middle grade books during the month of May and post about them with the hashtag #middlegrademay. Do this anywhere you normally post (Twitter, Litsy, Instagram, whatever floats your boat!) and then check out the hashtag to find some more great middle grade suggestions! It's worth mentioning that when I say "middle grade" I mean books that are aimed at kids in approximately 3rd-8th grade. At least that's what I'm concentrating on reading more of this month. What you choose to read is up to you! Let's help motivate each other to pick up middle grade books this month! What middle grade books have YOU read and loved lately?? I will take all the suggestions I can get!